DuoSTATION® MDM v4.8.16 has new features, optimizations and bug fixes. Here are the most important ones. Now it’s possible to send a request to update iOS on one or multiple devices. Select the devices in ‘Devices’ and then use ‘Actions>Commands>Schedule OS update on selected devices …’. We have updated the MDM-app for Android so now Android 9 is supported. In the last version we added a configuration to display information on the lock screen for iOS devices. Now this is also possible to do for Android devices. We us another technique to get the phone number of a device. The app no longer need permission to send SMS. Now you can change wallpaper on multiple devices at the same time by selecting them i ‘Devices’ and then use ‘Actions>Commands>Set wallpaper on selected devices …’. It’s possible to change picture for both the home screen and the lock screen or just one of them. We have added the column ‘VPP used’ to the view ‘Apps’. The column display number of VPP licenses that are used for selected group (and subgroups if ‘Include subgroups’ is checked). We have also removed the ‘Also show installed apps and VPP licenses in parent groups’ checkbox because it is not needed anymore. Now it’s possible to add apps that are larger than än 2Gb. The system prevents that apps, specifically designed for iPhones, will be installed on iPads. We have added support to use dynamically assigned certificates by using SCEP. Add, change and remove SCEP settings in the view ‘Certificates’. Then you can choose to install or use a SCEP certificate in the same way as an uploaded certificate. For now this is supported on iOS devices only. We have added new settings in the DEP profile so it’s possible to manage new steps in the setup wizard for iOS 12: Add cellular plan, iMessage and FaceTime, Screen time och Software update. We have dropped the support for Knox Container because noone was using it and this service will be deprecated by Samsung. 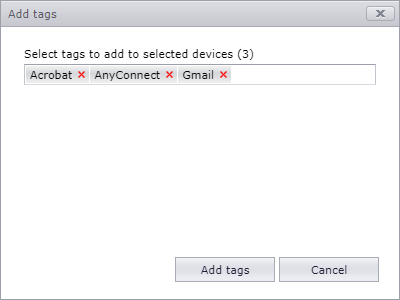 Now it’s possible to select multiple users or devices and then add or remove one or multiple tags. We have added a method to send messages to devices by using our API. Contact us to get the latest version of the API documentationen. We have changed the order of the configuration deployment. Firstly, restrictions and passcode policy will be deployed, secondly other types of configurations. And last app installations. We have added the possibility to use OAuth in Exchange configurations for the iOS platform. Now it’s also possible to use ‘Lock screen information’ configuration for Android devices. Allows apps that have been installed by MDM to change contacts in accounts that are not managed by MDM. Requires iOS 12.1 or later. Default for this setting is disallow. 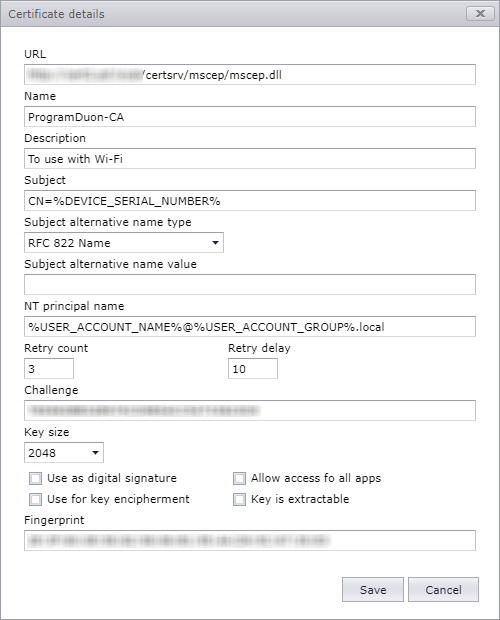 Allows apps that not have been installed by MDM to change contacts in accounts that are managed by MDM. Requires iOS 12.1 or later. Default for this setting is disallow. Prevents user to use an USB cable to manage an iOS device. Requires iOS 11.4.1 or later. Default for this setting is allow. 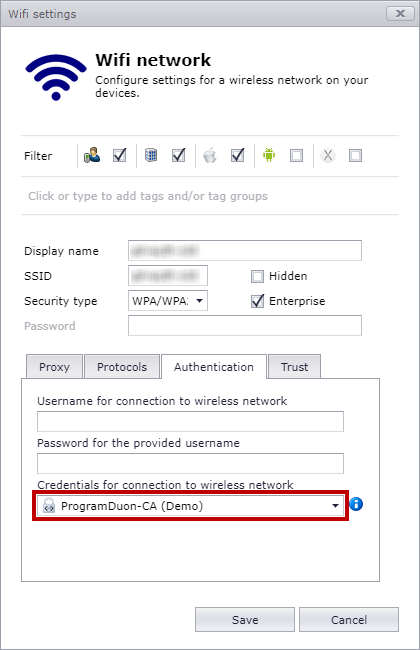 Allow or disallow access to contol center when lock screen is activated. Requires iOS 7 or later. Default for this setting is allow. Allow or disallow notifications when lock screen is activated. Requires Android 5 or later. Default for this setting is allow. Allow or disallow access to the noifications view when lock screen is activated. Requires iOS 7 or later. Default for this setting is allow. Allow or disallow access to the today view when lock screen is activated. Requires iOS 7 or later. Default for this setting is allow. 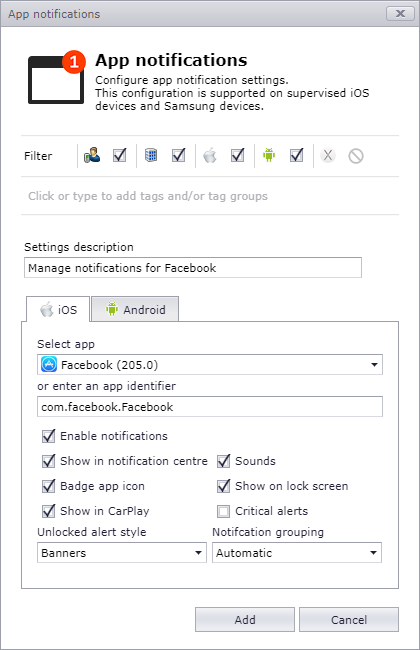 We have added a new configuration to control how notifications can to be used för a selected app. We have extended the possible to use for variables so they can be used in all configurations. A new variable (%DEVICE_PHONE_NUMBER%) to contain the device phone number has been added. We are developing an integration between DuoSTATION MDM and Google Play. This is not 100% completed yet and must also be approved by Google. This is why some settings and menu-options are deactivated in this version. When this integration is completed, it will for instance be possible to remotely install apps on devices from Google Play without setting up a Play account on the device. It will also be possible to control which permissions the apps will have on the devices. When the integration with Google Play is complete, it will be possible to enroll devices by using Zero-Touch Enrollment (ZTE). ZTE is Googles equivalent to Apple DEP or Samsung KME. More information about ZTE can be found here.